Upgrading your kitchen is one of the best things you can do to increase the value of your home. Since the kitchen is the room you likely spend the most time in, it makes sense that you’d want the space to be bright and welcoming. 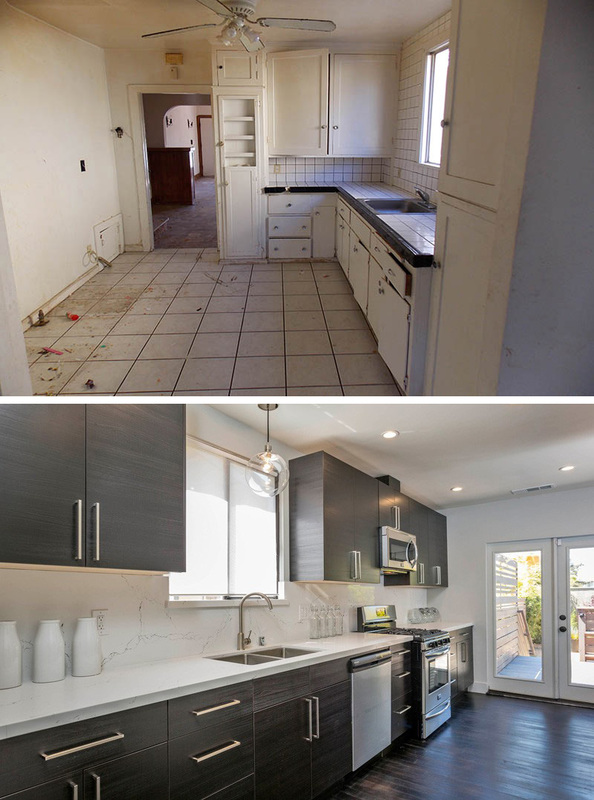 Today we’re sharing the before and after photos of 12 kitchen renovations that show what a difference a few changes can make. 1. 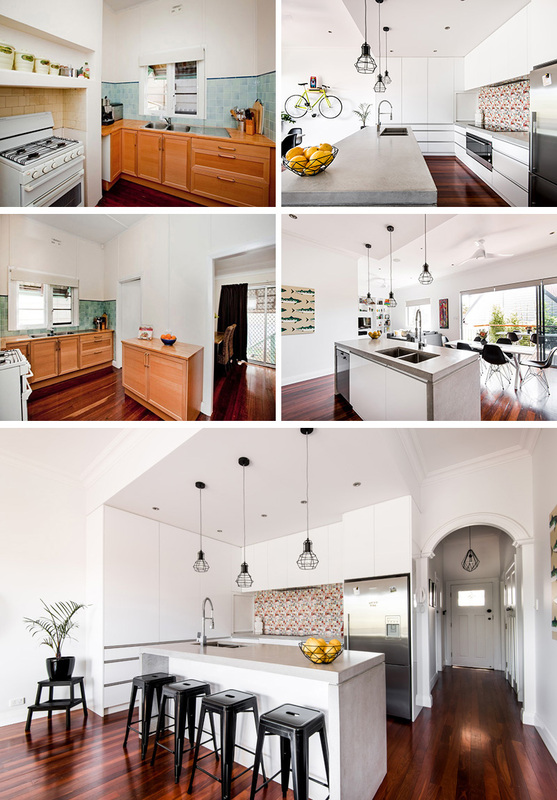 This outdated kitchen was transformed into a brighter happier space by opening it up, changing the light fixtures, upgrading the appliances, and adding a central island which helps connect the kitchen to the other areas in the home. Balodemas Architects designed the renovation of this modern home in Chevy Chase, Maryland. After photography by Anice Hoachlander | Hoachlander Davis Photography. 2. 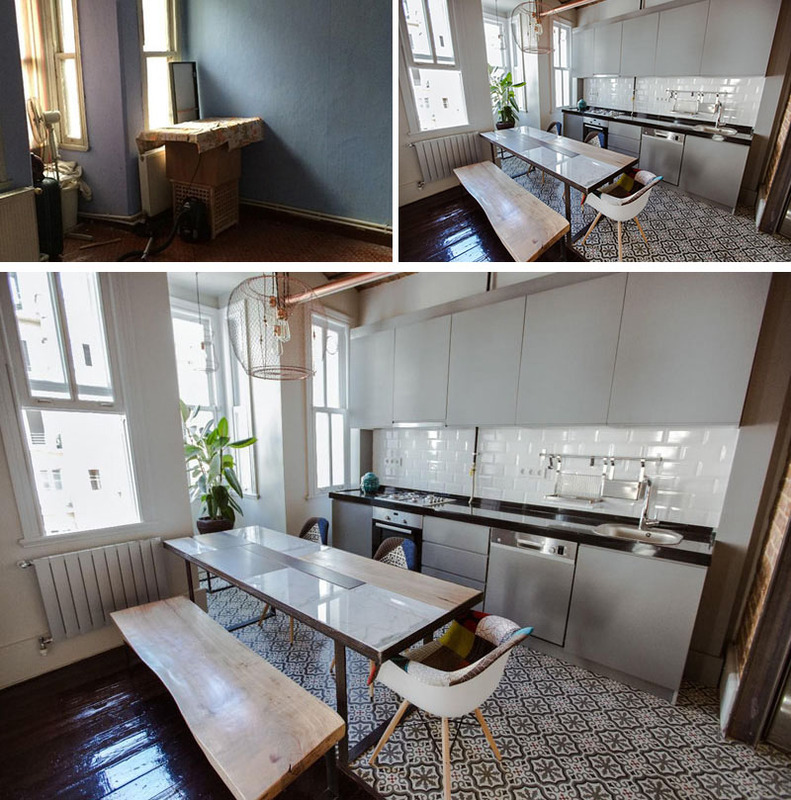 The small, dark, empty corner in this Istanbul apartment was turned into a kitchen and made to feel much more welcoming by adding light grey cabinets, a white backsplash, and white walls. SEA Architects renovated this modern apartment in Istanbul, Turkey. Photography by Özge Öncel. 3. 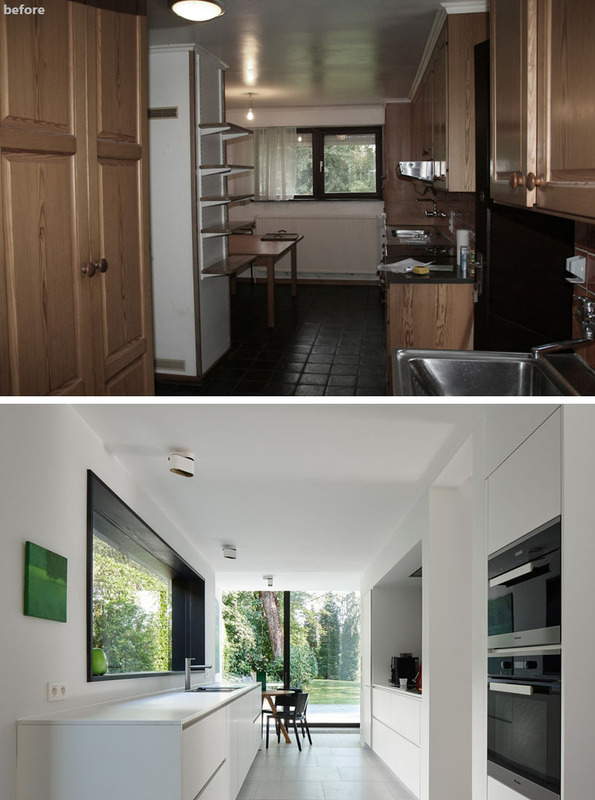 This once boring kitchen and living space was transformed into a modern kitchen and dining area. 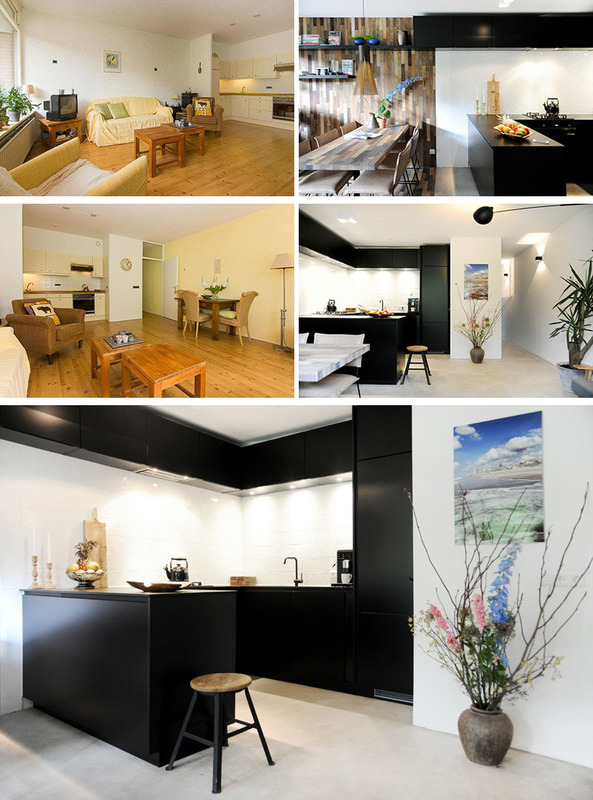 Black and white define the kitchen, while a wood panel feature wall designates the dining room. ZW6 designed the renovation of this modern home in The Netherlands. 4. 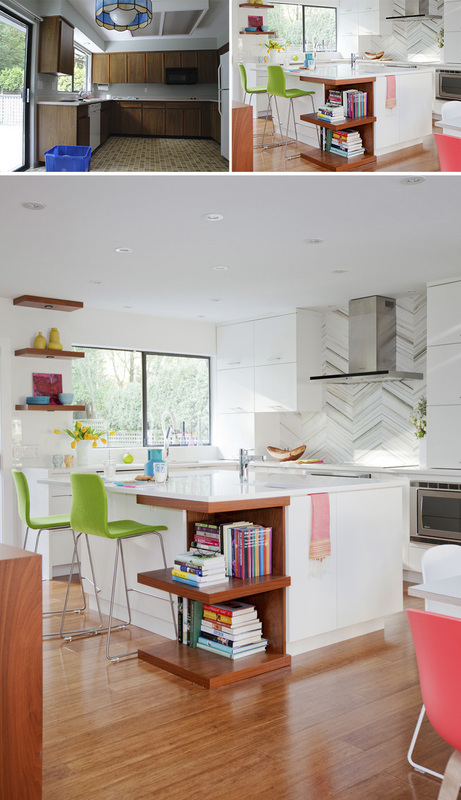 The wood cabinets and blue tile backsplash in the outdated kitchen were traded out for crisp white cabinets, concrete counter tops, industrial pendant lights, and a contemporary, colorful backsplash. Janik Dalecki designed the contemporary renovation of his own home in Australia. Photography by Dion Robeson. 5. By switching out the dark wood cabinets for white ones and taking down a wall, this kitchen became a modern spot where the family can hang around the kitchen island. Ami McKay redesigned this modern split-level home in Vancouver, Canada. Photography by Janis Nicolay Photography. 6. This kitchen was transformed from a dark tight space into a bright open one by adding a letterbox window, changing the layout of the kitchen, and adding built in appliances with an integrated fridge into a wood panel wall. SHED Architecture & Design designed the contemporary renovation of this home. Photography by Mark Woods. 7. Wood floors, new cabinets, counter tops, and backsplash, with a slightly rearranged layout gave this kitchen a much needed upgrade and turned it into a bright, contemporary space. Baran Studio Architecture redesigned this contemporary home in Oakland, California. Photography by Peter Lyons. 8. This wallpapered kitchen with very little storage and not a modern detail in sight, was transformed into a bright sophisticated one full of storage, new appliances, and minimalist touches. Office of Architecture redesigned the interior of this row house in Brooklyn. Photography by Ben Anderson. 9. The pink cabinets, outdated stove, and tiled floor were all taken out and replaced with shiny new appliances, bright white cabinets, a long island with bar seating, and a new wood floor to bring the kitchen into the 21st century. CplusC Architectural Workshop designed the modern renovation of this home in Sydney, Australia. Photography by Michael Lassman. 10. While the size remained the same, a new layout, new cabinetry, a stainless steel backsplash and new appliances gave this small kitchen a big upgrade and a more contemporary look. 11. A Stainless steel island and counter tops, white cabinetry, a large window, modern appliances, and a raised ceiling turned this family kitchen into a functional space. (fer)Studio designed the remodel of this contemporary home in Los Angeles, California. Photography by Jack Coyier. 12. 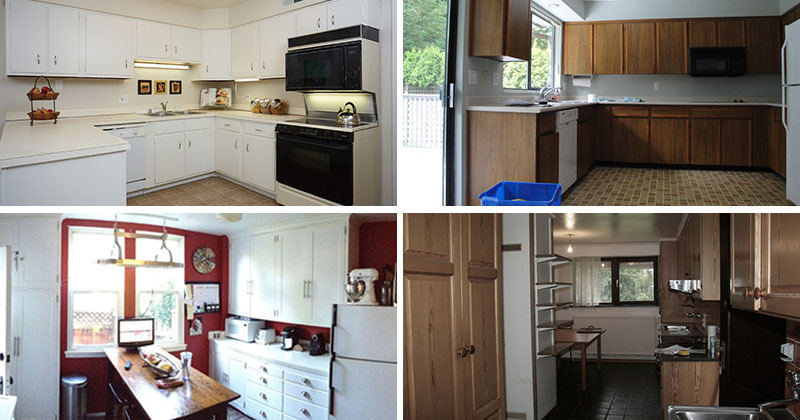 The wood cabinetry was taken out of this kitchen and replaced with clean white ones and built in appliances. The back wall was replaced with a sliding glass door to make this kitchen brighter, modern, and much more pleasant to be in. Edouard Brunet and François Martens worked together to redesign this modern home in Belgium. After photography by Dennis De Smet studio.